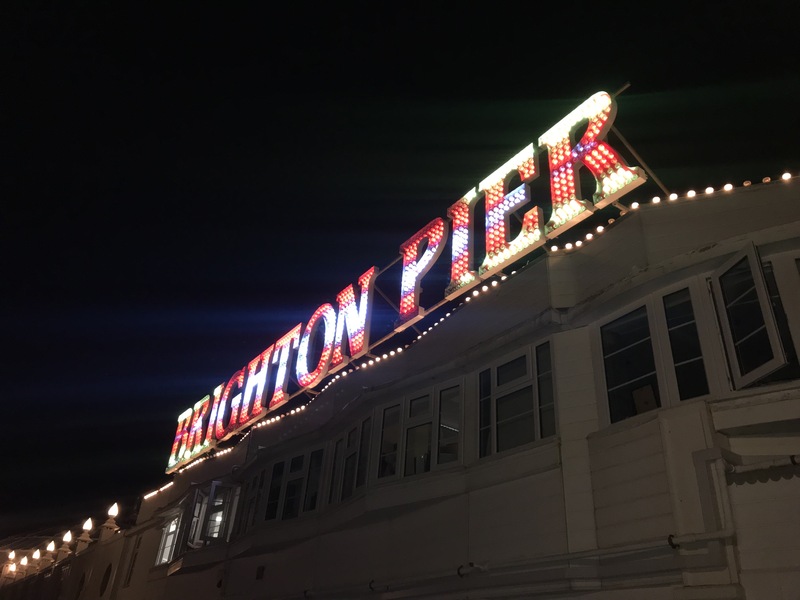 So if you did not read my Brighton Adventure Part 1 then just click here! To get the low down on the first part of my trip. This is a carry on with all the things that I got up to on my little bank holiday on the beach. I hope you enjoyed Part 1 and this one even more. 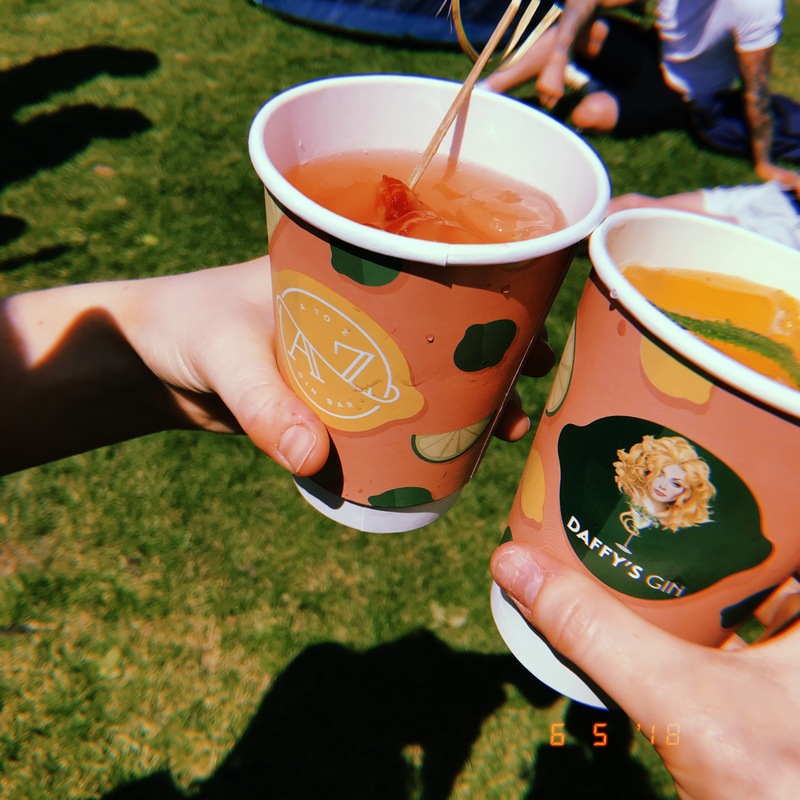 So after having a lovely brunch at SIX we found our way to the ‘Foodies Festival’ an absolute heaven for people who live for food. So the perfect place for me and my cousin! We also got a discount code for 30% off from watching Alfie Deyes video which was fab! 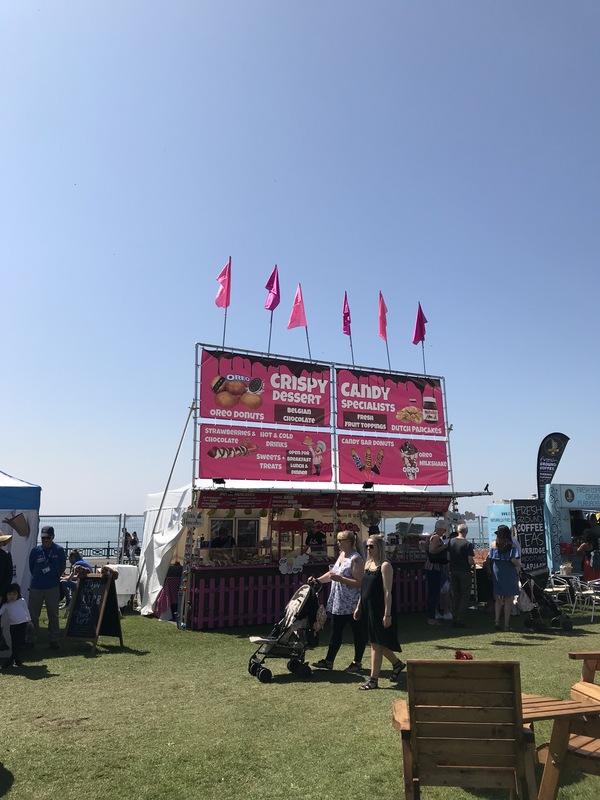 The festival was located on the Hove Lawns which are just along the beach front, with the weather to match this was the perfect location. It was packed with a buzz and the colourful bunting along the top I loved. How cool is this! 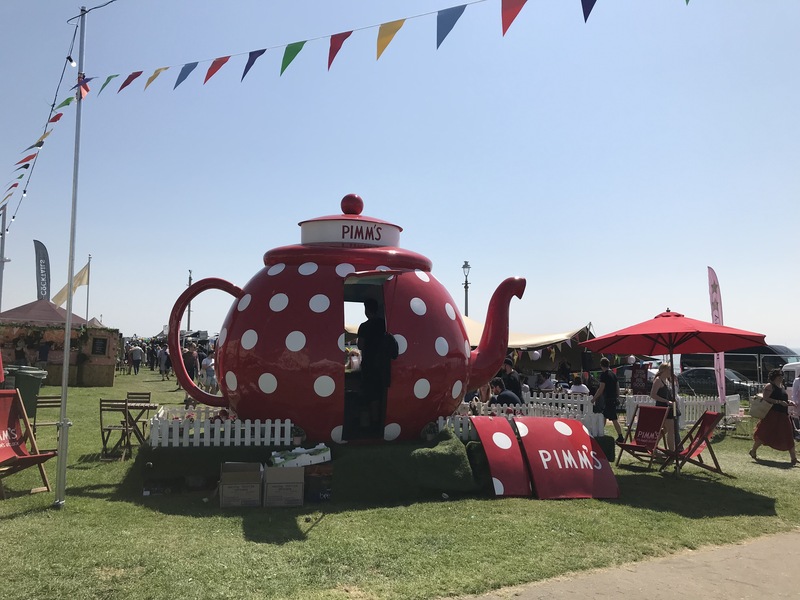 So I don’t think you need me to tell you what they are selling here in this massive tea cup, but I am definitely someone who can appreciate this stall. 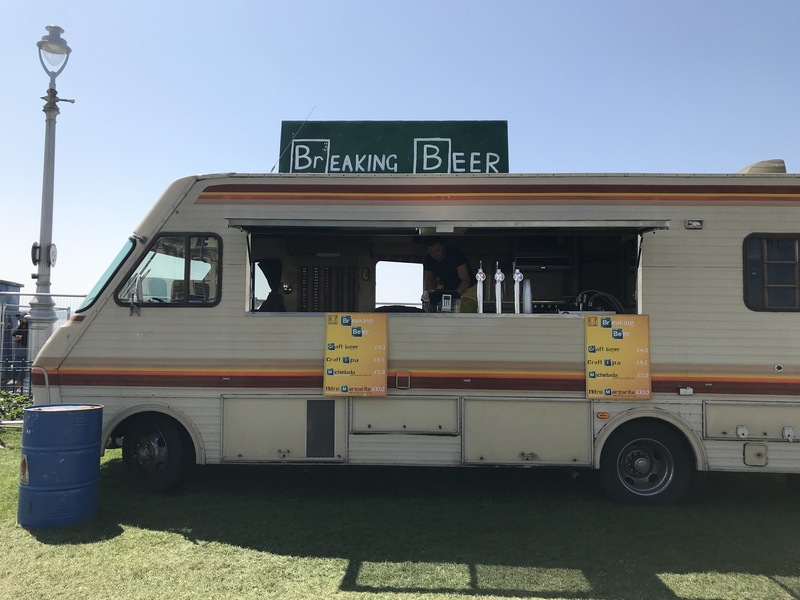 I think it was the most creative at the festival. There were so many different stalls to look at it was difficult to get photos of them all because of all the people, so these are just a few of the ones that I liked the look of the most. 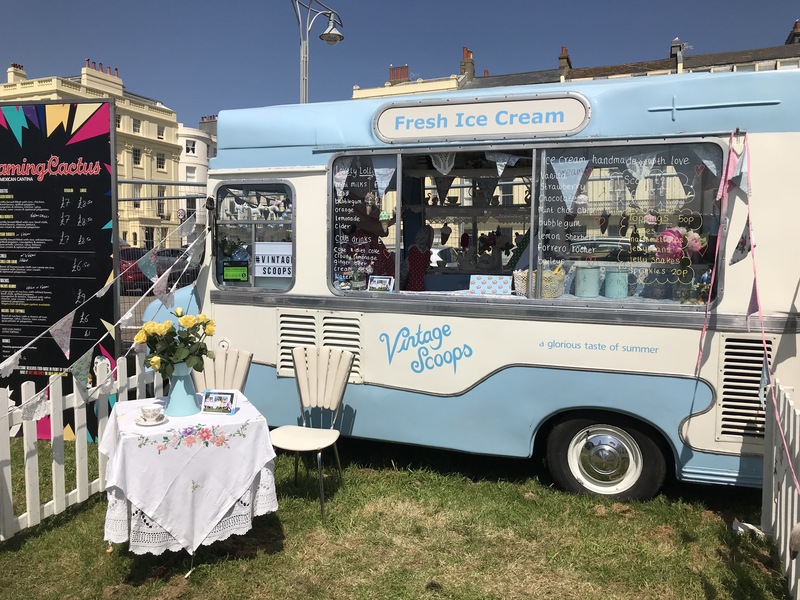 I thought this was the cutest little ice cream van ever! Also, they had such a range of different flavoured ice creams it was amazing. Everything from the stores were quite expensive but they were definitely worth it. Then we found the A to Z Daffy’s Gin Bar, the one station that we were most excited to visit. 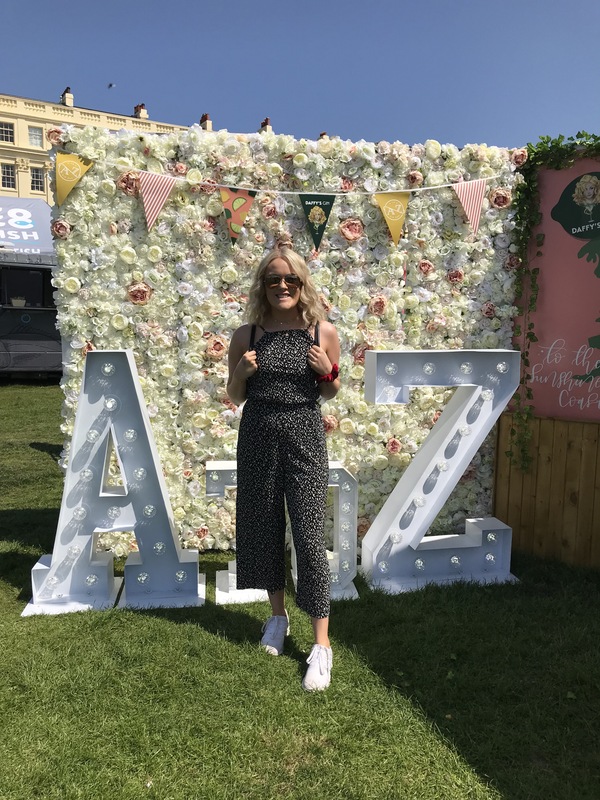 Daffy’s Gin collaboration with Zoe Sugg and Alfie Deyes with their NEW * A to Z brand they are launching, enabling them to have their own gin bar at the festival. 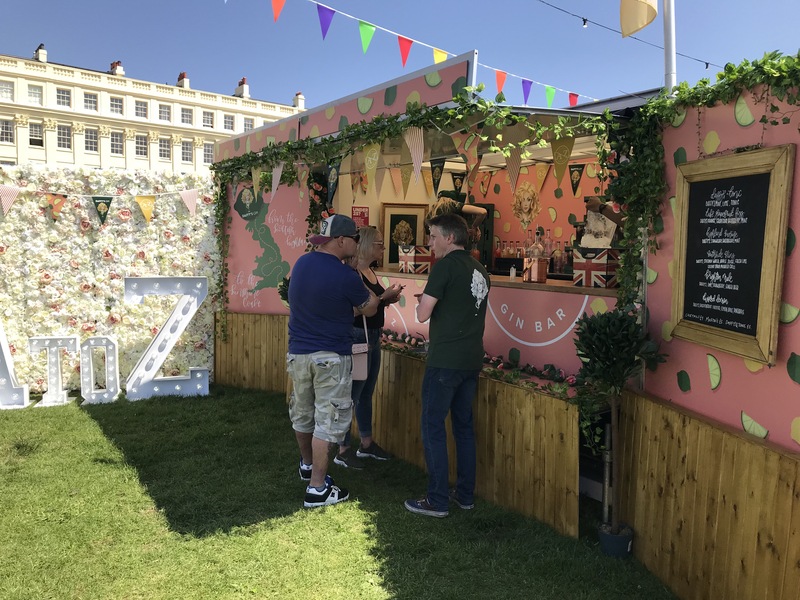 As a viewer of Alfie and Zoella, it was so cool to see what different projects they are getting up to, this one involving the Gin is possibly my favourite so far. We thought it would be rude not to try one of their cocktails that they had created themselves, with the team. I had the Orange, Grapefruit, Daffy’s Gin, Mint and GLITTER!!! This one I thought would look the coolest and consisted of my favourite flavours. It was delicious, I am not too sure which flavour Charl went for but it tasted fab! I had to have a photo in front of the flower wall because, you haven’t been there since you have had a photo to prove it! I visited on the Sunday, so I missed Alfie and Zoe as they visited on the Monday, so that was slightly gutting but, so glad I had the chance to visit. After enjoying a nice refreshing gin me and my cousin had some halloumi fries to share and a Bao Bun, which was a steamed bum with some pulled pork, hoisin sauce, cucumber and spring onions, it was insaneee, definitely worth the £8. We spent a couple hours wondering in food heaven but then decided to leave and carry on with the day as we still had plenty of things that we wanted to do. 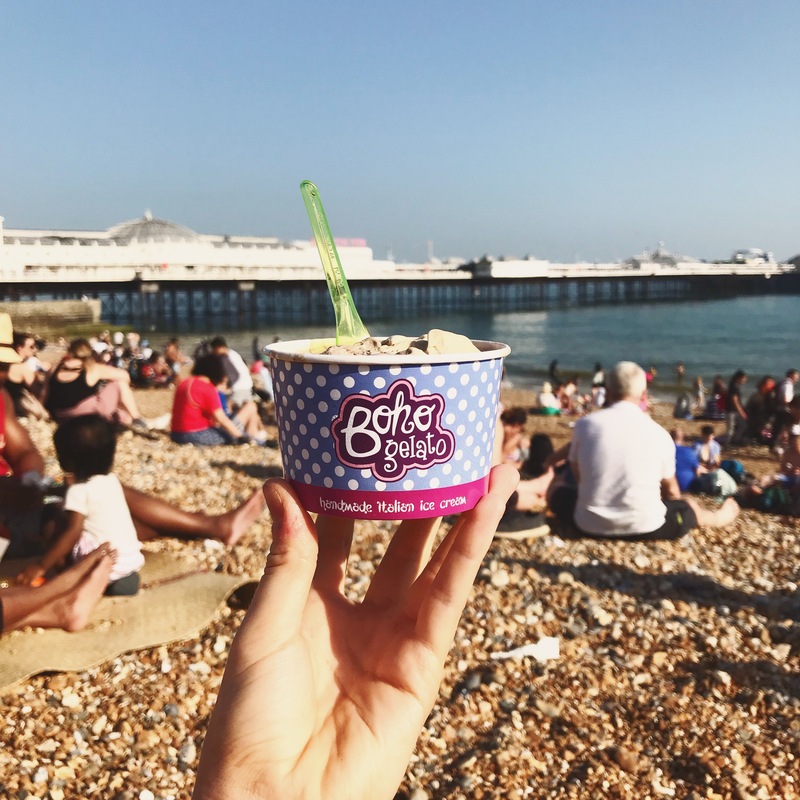 After the Foodies Festival only naturally you would do a couple more miles walking to the next ice cream shop?… Our next stop was Boho Gelato a place where I have been recommended to go by many people. Although, we had to wait half an hour in the queue which seemed never ending our of the door it was so worth it. When I finally got into the little shop, I went for Chocolate Orange Nougat, Cookies and Cream, and Salted Caramel, they had so many ice creams to choose from, but I had to choose quick because I didn’t want to hold the line up. Thankfully, I chose well! We then sat on the beach to enjoy it before it melted. We then went home for a little rest as the walking had killed us off. Shortly, after this we thought no better way than to go back to the beach for classic fish and chips (obviously we both had large), plus you can not beat a pot of curry sauce. It was the perfect sunset and the beach was buzzing with live music and everyone just really happy. It was also lovely how you could see the old pier in the background. 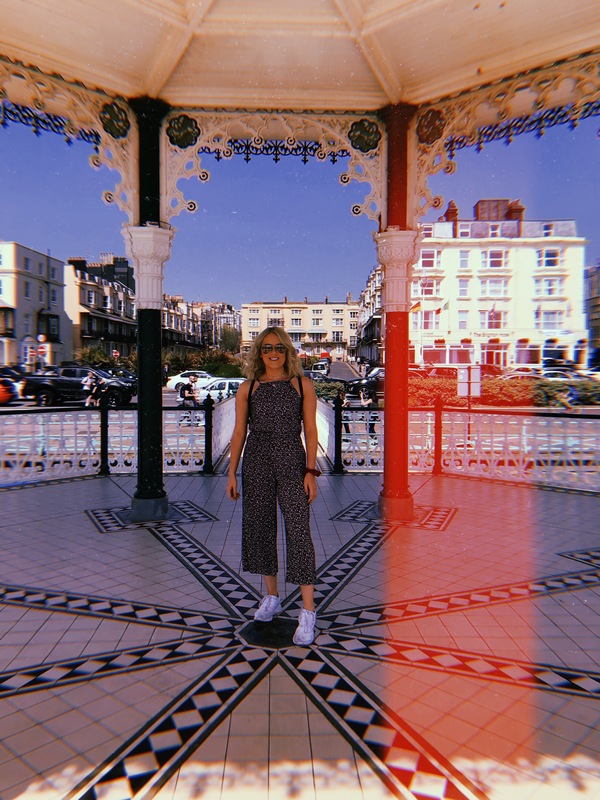 Day 2 then came to an end with a little walk along the Palace Pier, sadly the day after we were leaving lovely Brighton. 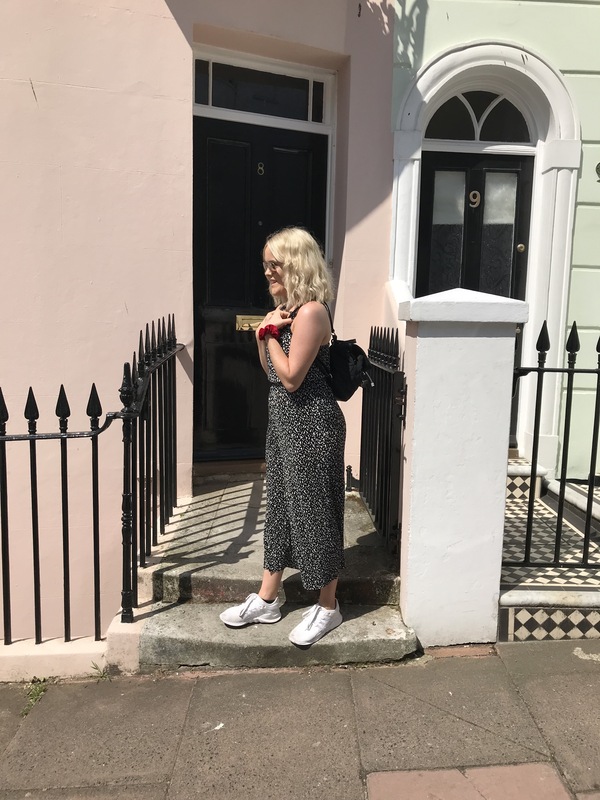 The last day came around far too quickly… but we didn’t waste any time in getting out and about by finishing a few of the things we still wanted to do. We stopped off for breakfast at Cafe Coho just around the corner from where we were staying, so it was perfect. Also the photos they have online just looked like something that could not be missed. So for my drink I had a nice ice latte with some vanilla syrup, just to sweeten it up that little bit. It was just what I needed for a little morning wake me up. 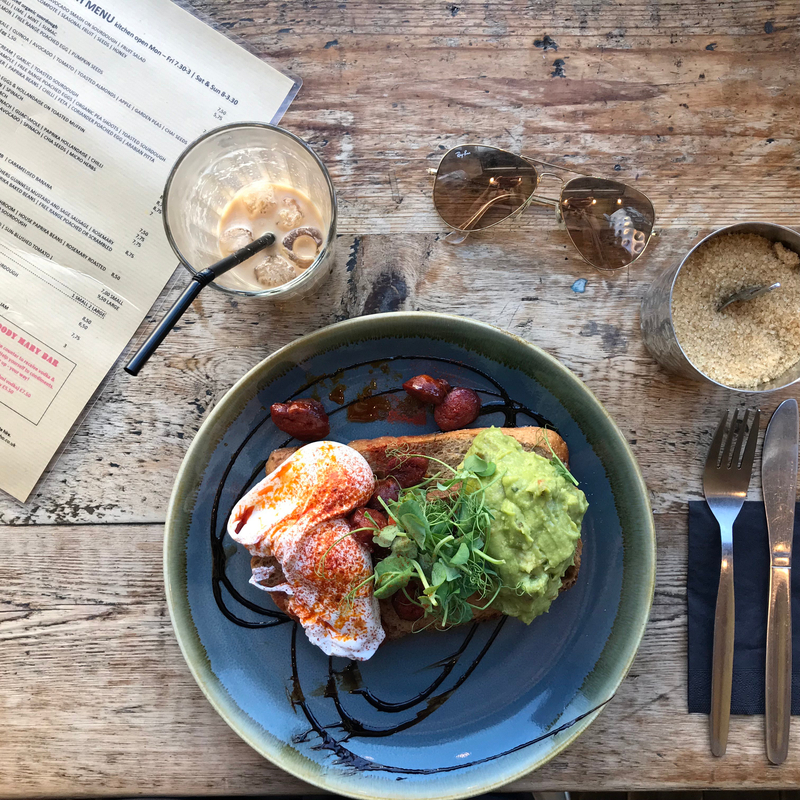 My breakfast consisted of lots and lots of loveliness, it was spicy chorizo, two poached eggs, guacamole, on two slices of crispy sourdough. It was definitely perfect for the weather and set me up for the day. Lastly, Me and Charl could not leave without buying some Dum Dum Donuts. So this was the last stop of the trip before we headed home. The shop was tucked away in the lanes, and was the cutest and pinkest little shop. I paid £15 for 6 donuts, which all look delicious, three of them were donuts and then three of them cronuts (which have some flavoured cream inside). They were worth the money and I took some home for my friends, because who doesn’t love a donut. I had the Banoffee and Triple Chocolate which were so tasty. 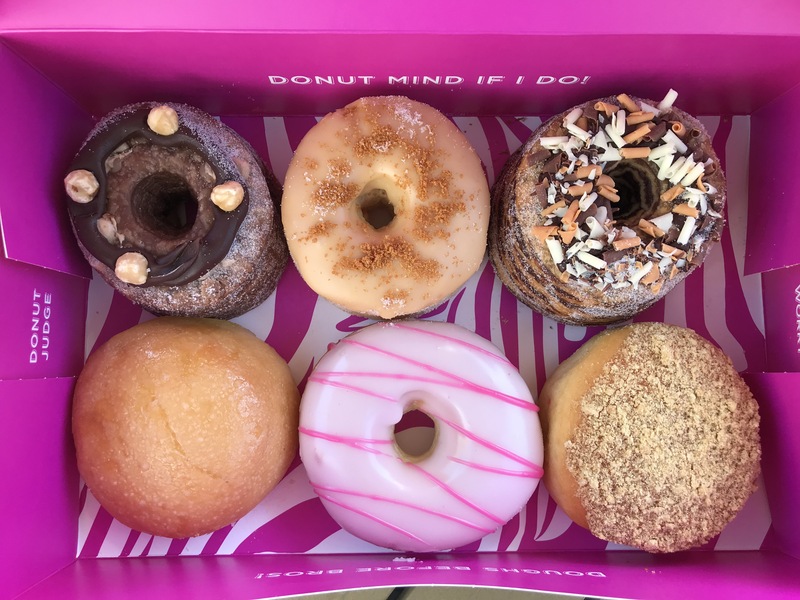 Which donut do you think would be your fave? After picking up our donuts it was our time to leave sunny Brighton until next time. It was such an amazing time and I definitely needed the little getaway in the sun. Also, spending some time with my cousin and doing all the things we love to do together (eat, eat and eat)! 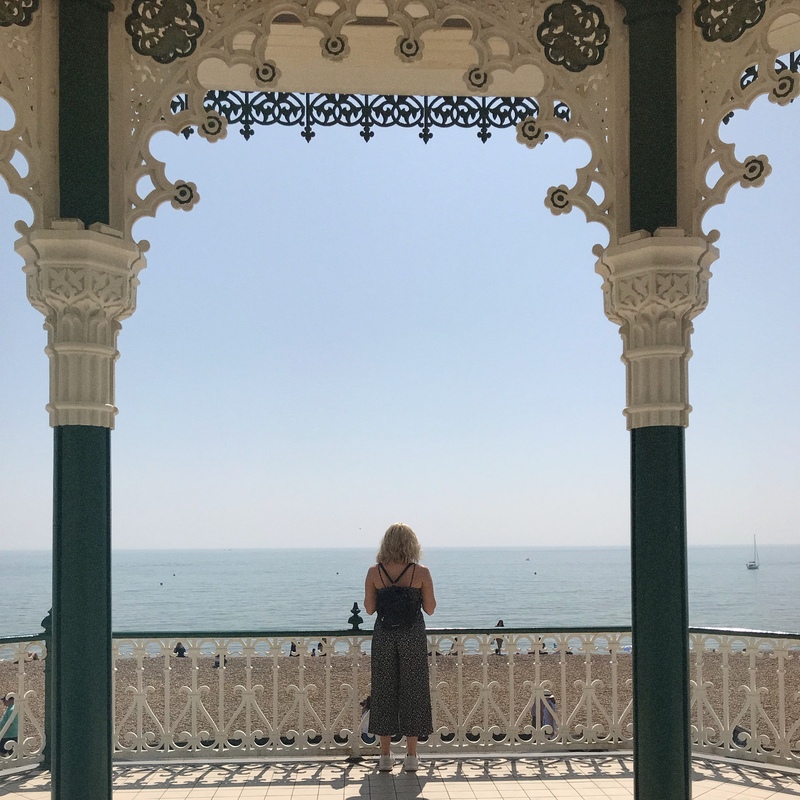 That was all for my trip, but I really hope that you enjoy reading it and it inspires you to visit Brighton soon. It has so much to offer and you can have the best time there. 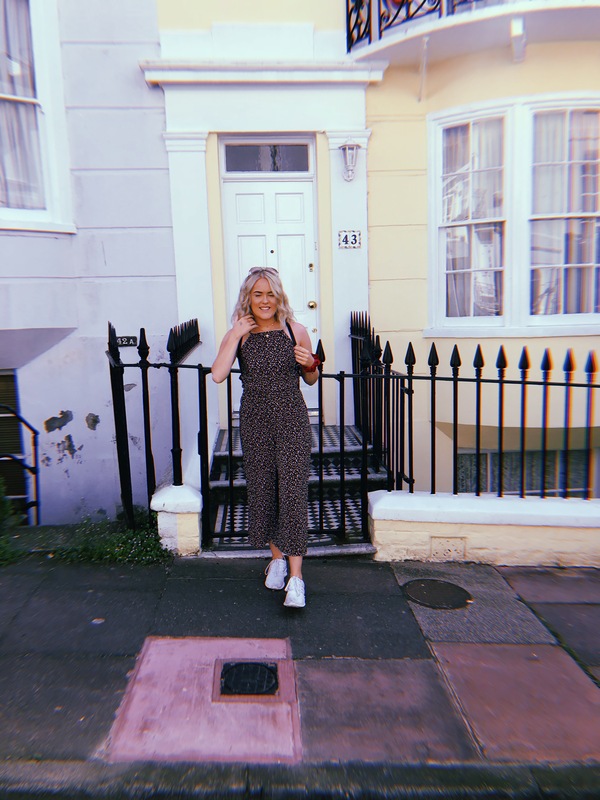 Let me know what you think about the places I visited, I love to hear your thoughts and also any recommendations for the next time that I visit. Thanks for sharing such a fun trip – great photos as well – bravo! I want that red tea pot stall!! 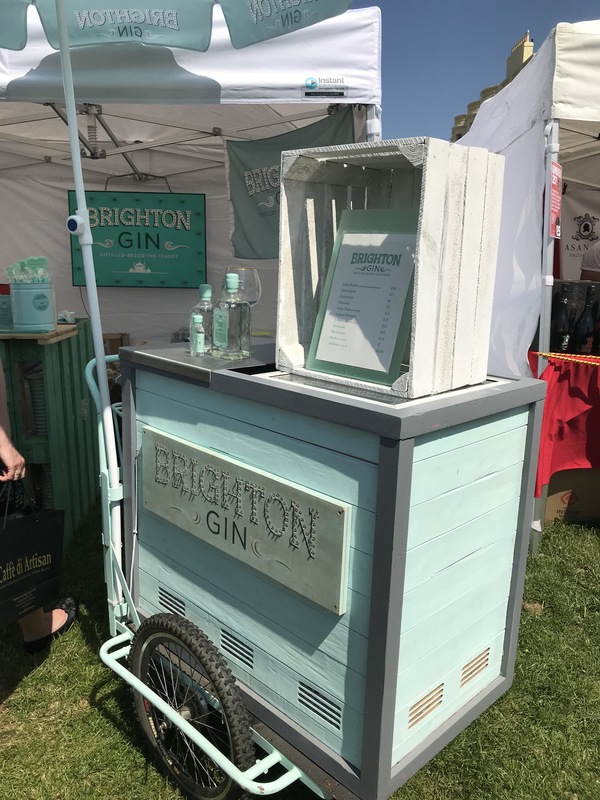 Think of all the events that you could host with it 😍 I wish that I could be so creative when thinking of things – I would have had a boring ol’ stall! 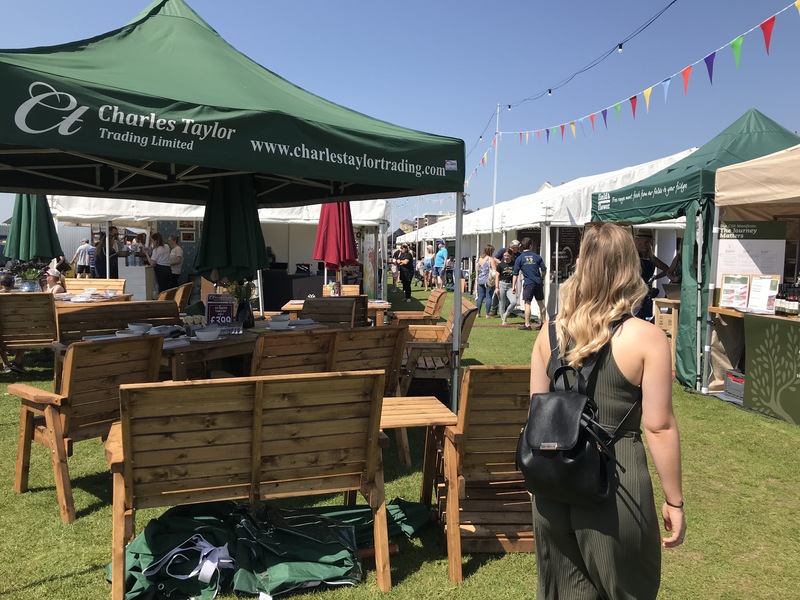 I would love to go to that food festival next year – they’ve got so much there, I think the hardest bit would be deciding what to try! It looks like a great time! I love that giant teapot! How much fun. Brilliant post!